Change your POWER training forever! Manufactured using the same technological innovations used to develop mediBall Pro, we have thickened the skin and weighted the plastic to produce a high rebound ball and a very dynamic training environment. 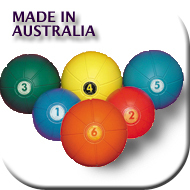 Conveniently air-filled, you can increase or decrease the 'bounce-factor' by inflating or deflating the ball. AOK health manufactures Live Medicine Balls in 6 sizes, 1 to 6kg, thus allowing you to vary weights of the balls for optimal sets, reps and recovery.